Vithanco got a new diagram type. The Casual Loop Diagrams. Why using Causal Loop Diagrams (CLDs)? Causal Loop Diagrams (CLDs) are a way to capture systems, to analyse them and to plan how to influence them. CLDs explain long-term behaviour of systems which is otherwise difficult to understand based if you only look at the current as-is snapshot. CLDs describe systems via “stocks” (nodes) and connections (edges). Much of the day-to-day world can be accurately described as such a system. Let’s look at a simple example: A bank account and the interest earned. The amount of the Bank Balance (a stock) will affect the amount of the Earned Interest (another stock), as represented by the connection, pointing from Bank Balance to Earned Interest. Since an increase in Bank balance results in an increase in Earned Interest, this link is of the same kind, meaning more results in more. Interestingly, this even works for a negative amount in your bank account. The Earned interest gets added to the Bank balance, also a link of the same kind, represented by the bottom connection. The causal effect between these nodes forms a positive reinforcing loop, represented by the icon in the middle containing an “R” and showing the loop direction (clockwise). This system is obviously only a part of bigger system that would include salary payments and withdrawals to live. But if left alone, the reinforcing loop points out that this system would lead to an uninterrupted growth of the two stocks involved. A CLD is very useful to identify the loops that affect the systems’ behaviour. Especially the separation between balancing and reinforcing loops provides meaningful insights into a system’s behaviour as shown in the following table. Balancing Balancing loops have an odd number of opposite connections (negative links). Balancing loops are associated with reaching a plateau. Reinforcing Reinforcing loops have an even number of opposite connections (negative links, please note that zero also is even). Reinforcing loops are associated with exponential increases/decreases. The example above with the bank account and the interest earned has a reinforcing loop, which based on compound interest does indeed show an exponential increase. Loops are automatically identified by Vithanco. Extensive research was done regarding systems (see as a starting point: Donella Meadows’ Thinking in Systems) as part of a body of knowledge called systems thinking. One interesting way of accessing systems thinking knowledge is by learning about the so-called archetypes. Learn more about Vithanco’s implementation of CLDs here. Laying out a graph depends on node order. The nodes are created in an order and this is the first order used. By maintaining that order Vithanco ensures that the nodes are located where they are and that small changes in the input leads to only small changes in the output. That means that in most cases the leftmost node stays leftmost. The layout algorithms are stable in the sense that they produce the same outcome for the same input. And the order of nodes is part of the input. And sometimes the original order is not the order you like. You would like the nodes presented in a different order, exchanging two nodes that are located next to each other, or similar. You can change the order of nodes and thus can influence the resulting diagram by using the [TAB] key. Simply select two nodes and press [TAB] and the two nodes exchange their place in the order of nodes. If you select more than 2 nodes and press [TAB] they are rotating their position in the order. Finally, press the [ALT] (or [OPTION]) key at the same time as [TAB] and the order is shuffled. You can use [TAB] in all diagram types. or similar. The above list is not complete and the used algorithms are quite sophisticated. There are more ways to influence a diagram but these will be captured in another post. The following is an example from a domain that will be released during first half of 2019: the “Causal Loop Diagram” or “CLD” in short. Causal loop diagrams are used to analyse systems and their behaviour. CLDs aren’t layered as they are normally full of cycles (“loops”), meaning they have a lot of connections that would point from the bottom to the top. Hence CLDs use a star layout. The structure of this CLD archetype is not very obvious. Edges are overlapping, making the understanding unnecessarily difficult. Now press [TAB] and the order of the two selected nodes is exchanged, resulting in a different positioning of these nodes in the internal order. In this example they simply exchanged their location as well. Now the structure becomes clear. The edges are no longer overlapping and the three loops become visible. For a long time do I believe in the value of visual thinking. Clearly, not all visual thinking would use graphs such as Vithanco is allowing to manipulate. In fact, graphs are a just one approach to visuals among many. Clearly, the author believes it is a powerful approach, not least because it allows structure whilst still using additional senses over text-only approaches. Ole Qvist-Sørensen was presenting his view on visual thinking at the TEDx Copenhagen 2012. I think it’s a great presentation. I have seen the works of Ole and his company. We used Bigger Picture quite often at the company the author works. I can only confirm the usefulness of his drawings. There is something that makes you contemplate a good (enough) drawing unlike a lengthy text. Book his company or simply draw yourself. It is worth it. Dan Roam has a similar message as Ole in his “napkin” books or in the potentially even better “blah, blah, blah” book. The latter presents even some kind of “grammar” for visual drawings. How does Vithanco fit in? Vithanco is clearly less flexible than pen and paper. It is “only” drawing graphs. However, I believe that there is a case for Vithanco. Vithanco is useful as an explorative tool. It can help you to “think things through”. Auto layout will prevent you from wasting your time on arranging drawing elements whenever a small change is happening. The domains enforce that you stick to the underlying structure of the diagram. Vithanco is therefore useful in a changing environment. 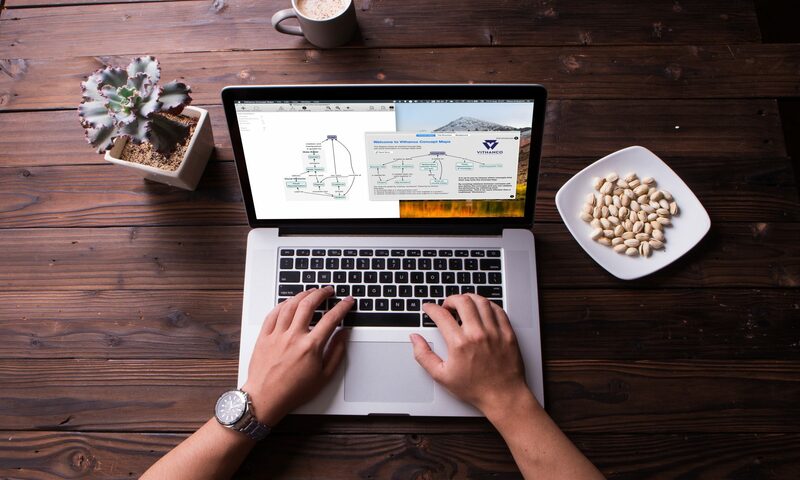 If you don’t know where your analysis will end and/or you need to add elements at any point of time, potentially even maintaining one diagram over a longer period (consider for example a Benefit Breakdown Structure that should reflect your project throughout the project lifetime) then Vithanco is the right tool. Ole mentioned in his talk how powerful it can be to work together on a drawing. I challenge you to do the same with Vithanco. According to a German proverb, four eyes see more than two (and a quick online research shows that not only the Germans have this proverb). This is so true when we discuss visual thinking. Whatever method you use there are nearly always conventions, supporting ideas or simply shortcuts. Recently was I shown an IBIS cheat sheet created with Compendium (a no-longer maintained IBIS software). I don’t like the looks of the Compendium very much. But I liked the content and decided to recreate the cheat sheet. These diagrams are created with Vithanco using the IBIS Domain. The 7 “root” questions are simply 7 kinds of questions. See below a generic diagram that uses these 7. I hope these diagrams make us much sense to you as they do to me. If you do have any questions, please bring them forward. And clearly, let me know if you have similar interesting items. Vithanco is the generic app that I had in mind for a long time. It is a superset to the other Applications, that is Vithanco IBIS, Vithanco Concept Maps, Vithanco TOC. So, you can open any of the files created with these Apps in Vithanco. In addition, you can use other Domains that I did not release separate, like Benefit Realisation of Impact Mapping. Besides the ability to work with more domains there is another big difference to the other applications. Vithanco allows you to define your own domains. Just create whatever graphical language that you want and create according diagrams. If you have a good domain definition, please send it to me and I will include it in future versions. I changed the payment approach to the application in comparison to the single purpose applications and in comparison to a previous announcement. I decided to sell 365 day licenses as In App Purchase. Without the license you will need to live with a watermark and with a limitation to 20 nodes. The annual license will remove the watermark and will allow diagrams with as many nodes as you like. I thought I was ready to release late October but then I had issues submitting the Application due to some odd configuration issue, then I was stuck in Apple’s Review… However, I used the time to polish the Application. And now it is – finally – released. Find it here: https://itunes.apple.com/dk/app/vithanco/id1441915970?mt=12Please provide me with your feedback! In the book It’s not Luck Goldratt’s hero Alex Rogo is creating a medium-sized Current Reality Tree. I re-created the CRT in Vithanco. Goldratt didn’t fully define the tree in the book. I needed to make some connections up for myself. Please let me know if I went wrong. Goldratt didn’t connect UDE #11 at all. If you have read the book then you know that it was the task of Alex Rogo to connect all UDEs. This seems to me to be the obvious example CRT. However, I couldn’t find anyone who had published this example. Fun fact: I only recently read It’s not Luck for the first time. This is actually quite funny as I have used the TOC Thinking Processes for quite some time but I was simply not aware that they were presented in this book by Goldratt. Instead I read the Thinking with Flying Logic a manuscript that is delivered together with the really good Flying Logic software (which was a huge influence for Vithanco). Furthermore did I read Lisa Scheinkopf’s Thinking for a Change. I even read Dettmer’s executive version book. However, I am happy that I now read the book as it is a useful introduction. Clearly, the book has a message and is therefore not a true novel and some of the examples are more questionable than others, but that is besides the point. I highly recommend the book. “Dark Mode” or “Dark Appearance” is a feature introduced with macOS 10.14 Mojave. I always preferred to write white on black (or similar) on my computer instead of white on black. Apple seems to think I am not alone with this preference and introduced a bright on dark appearance (“Dark Aqua”) for the whole of macOS. It was no question for me that Vithanco needed a dark mode. And I believe that the result was worth it. One of the consequences was that I needed to review exporting the diagram to an image. The old export was unaware of appearance. The new export creates light appearance PNG, JPG or PDF. But I added as well “Dark PNG”, and “Dark JPG” export. When will it be released? Soon. My task list became very short over the last weeks. I would expect a release of the new Vithanco and an update to all the other versions this month. I like visual thinking and whenever I come across a new method then I am make notes for future usage. One of these is the Impact Mapping, developed by Gojko Adzic. Impact Mapping is a nice quick way to identify the best approach to achieve a goal. The basic structure of impact mapping is very simple. You start with a goal, identify all the potential actors, analyse how they can help or hinder you, and then identify the solutions that might help or prevent your actors in order to achieve the goal. This is so simple and yet so powerful that it had to find it’s way into Vithanco. Right now it’s only available on my computer, but soon it will be released.